And easy it was. Basically, find five gal/ 18.9L or so of preservative-free, no sugar added, 100% juice apple juice, dump it into a fermentor, and pitch the yeast. Game, set, match. The worst part is the sideways glances you get at the local grocery for wheeling around with five gallons of apple juice. You can add some extra sugar if you like more alcohol for the sake of alcohol, but I didn’t bother; it will also dilute the apple flavor a bit. You can also adjust to taste at bottling with acid blend, but again I didn’t bother—this will depend on the brand of juice you get. I used two kinds of juice only because my grocery store didn’t carry five gallons of one sort. The only other thing I added was yeast nutrient, which is important in such a nutrient-poor medium. I forgot the first night and added it the second. The start of fermentation was sluggish, but it perked right up after the nutrient addition. Fermentation Temperature: I pitched at 67F/ 19.4C and it rose and stayed at about 70F/ 21.1C for the duration of the ferment. It took a little longer than my usual beer to ferment out, about two full weeks; perhaps a touch more nutrient would have helped. Overall: This is about the easiest thing I have ever fermented on purpose, and certainly the only one that didn’t make my refrigerator smell. I’m not that familiar with the cider world, frankly, so I don’t know how it stacks up against commercial or award winning versions. From my memory of it Longbow when I had it once about seven years ago, this seems to finish not quite as dry and has much more flavor intensity. I certainly find it preferable to many of the overly sweet commercial interpretations. As easy as this is, its great to have around for something different or for those who aren’t as keen on beer. I definitely enjoyed it enough to make again. I did mine with spiced apple cider and US-04 and the yeast attenuated well without nutrient blend. But the end result was way too dry so I add apple juice to taste in a glass to sweeten it up a little bit. I wonder if the spices, especially cinnamon, might need a little sweeter of a backbone to balance them. This was definitely dry, but not in a bad way. I actually kept thinking it was a bit sweet when I was tasting it, but it was just my brain associating apple with sweet I think. Maybe a bit of actual sweetness from the ethanol, and maybe some esters from the yeast. I’ll have to try it again with just some plain ol’ apple juice then and see how it differs. Thanks. Yea I’m just guessing. I’m just thinking about when I eat something with cinnamon in it, it seems to give a drying sensation in the mouth. And there’s the whole cinnamon challenge thing. For some reason, 3711 has been taking upwards of 3 weeks to fully attenuate apple juice. I just picked up some Belle Saison and plan to throw a batch together soon, hopefully it goes a little faster. Cheers! Yea, mine took a bit longer than usual, but not three weeks. Maybe a wine style staggered nutrient addition would help, but that seems like overkill. I ended up leaving it in primary three weeks instead of my usual two so it had time to settle a bit after it finished. I might switch over to the Belle Saison next time too though- that stuff is a monster, and I wouldn’t mind shaving off an extra point or two from the FG I got with 3711. In fact, I’m almost tempted to try a champagne yeast, but I think I would probably like the contributions of a saison yeast a little more, and I can’t imagine champagne yeast taking it much lower than the Belle. Try doing this without any nutrient additions, and at the lowest temperature the yeast will tolerate. Cider is a wine, and the apple flavors and aromas are delicate – so a slow, cool fermentation generally gives a much better result. The best ciders in the world are made using techniques to remove nutrients from the juice, starving the yeast so it just barely ferments at all! Don’t bother with Champagne yeast, it is far too aggressive and will remove nearly all of the fruit character. Unless you crash-chill it partway through… but then you have to stabilize it somehow to prevent restarting. 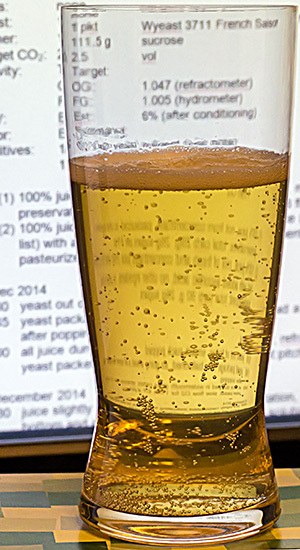 Cider has a more delicate flavor profile than grape wine, and the apple aromas and flavors that most people desire are mostly destroyed by strong fermentations. Slow, cool fermentations retain more of the volatile aromatics; and apple character is largely a function of aroma. Ciders in the French or English traditions focus on apple character and use techniques to remove nutrients and slow fermentation. German apfelweins are very different, made more like grape wines, less appley and with more of their character contributed by the yeast. Which set of techniques to use depends on the style of cider you desire.